The term cyber-utopiansm refers to the belief that communication technologies are political tools for democracy and popular emancipation by themselves. This enthusiastic view of cyberspace, which defends that corporate power is selling its gravedigger to the crowd in form of technology, has been present on the internet from its very beginnings, but specially from the development of the Web 2.0. Cyber-utopianism can also be considered as a branch of Extropianism, an heterogeneous ideology mostly developed during the 1990s by the british philosopher Max More and whose principles are based on the defense of the the “boundless expansion, self-transformation, dynamic optimism, intelligent technology [and] spontaneous order” of human kind, all of them allowed by the combination of reason and technology. According to More, who is now the president of the largest provider of cryonics services in the world, "Extropy means supporting social orders that foster freedom of communication, freedom of action, experimentation, innovation, questioning, and learning. Opposing authoritarian social control and unnecessary hierarchy and favoring the rule of law and decentralization of power and responsibility"
Although it has been heavily criticized, mostly because of its alleged naivety, some initiatives such as digital activism, e-democracy, virtual communitarism, digital currencies, alternative social networks or even crowdfunding can be said to be inspired by cyber-utopian aspirations of freedom and independence. Taking “utopia” as the creation of an ideal or perfect society and a new anthropological definition of man (Breton 1995, p. 44), media technologies have always been closely connected to it through the myth of progress and the yearn for the betterment of society. From the birth of the print to the radio and the portapak, but specially from the advent of the internet and the consequent development of the information society, there is a believe in that media will be able to revive and promote community relations, give voice to marginal discourses and to set up anew communicational agora able to bring humanity in a whole. (Mattellard, 1999). This sensibility towards communication dates back to the Enlightenment, and it actually places the development and transparency of communication as the central axis in the organization of society. “The myth of the machine” or the image of technology and progress as the exploitation of natural resources through the mechanization of labour, has been replaced by the myth of the information. 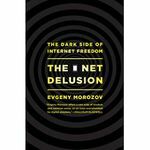 According to Morozov (2011: 13), the origins of cyber-utopianism can be thus traced back to the counter-culture of the 60s, or more precisely, to “the starry-eyed digital fervor of the 1990s, when former hippies (…) went on an argumentative spree to prove that the Internet could deliver what the 1960s couldn’t: boost democratic participation, trigger a renaissance of moribund communities [and] strengthen associational life” (ibíd). Cyber-utopianism is also intimately entangled with techno-utopianism, a movement that began to flourish in California during the 1990s, specially around Silicon Valley. On his 1995 essay The Californian Ideology, Richard Barbrook and Andy Cameron argue that technological utopianism derives its popularity from the ambiguous, even paradoxical mixture between neoliberal economic policies and the anti-corporate ideology of the left. On the one hand, it is believed that the values of the bohemian counter-culture are shaping the development of the information technologies, with the inevitable result of a future emancipation of hypermedia from corporate capitalism and nation-state governments. However, it is becoming more and more evident how the “virtual elite” has enforced a laissez-faire logic of traditional forms of capitalist powers. This tension is well portrayed by Wired magazine, which even if considered as the bible for cyber-utopians and having adopted some precepts of McLuhan technological determinism, has uncritically reproduced the views of Newt Gingrich, the extreme-right Republican leader of the House of Representatives, and the Tofflers, who are his close advisors (Barbrook and Cameron, 1995: 7). Thus, whether the contradictory mix between marxist technological determinism and libertarian individualism will conform the internet as an “electronic agora” (Rheingold) or an electronic marketplace is yet to be disclosed. The concrete focus on social media and communication technologies has been considered as distinctive of cyber-utopianism, whereas the focus of technological utopianism would be broader. a) Hides the mechanisms of communication platforms, which still dominate and control the landscape despite of the presence of alternative sources of information. The disproportionate amount of alternative informants can actually benefit the stablished authorities of communication, since the chaos and disorientation created by this information overdose reinforces the dependence on traditional, nation-state dependent institutions. As Tim Jordan posits (1999), "By providing powerful tools to the individuals, cyberspace seems to offer power. Yet, the reliance on this tools ensure individuals become more dependent on the elite that create and maintain this tools"
b) Provokes the depolitization of the population through the free, excessive entertainment available. In 1996 the Critical Art Ensemble (CAE) coined the term Electronic Civil Disobedience as an alternative to the political homogenization that cyber-utopianism conveys, affirming that electronic political activism should be kept away from the eye of electronic popular/public media (as in the hacker tradition). Although they share its reliance on information technologies to achieve political change, the CAE, “rather than attempting to create a mass movement of public objectors, suggested a decentralized flow of particularized micro organizations (cells) that would produce multiple currents and trajectories to slow the velocity of capitalist political economy” (CAE, 1999: 13). For the CAE, which takes the notion of nomadic power and the structure of rhizome from Deleuze and Guattari, the diversity and multiplicity of the cells would function as a strength rather than as a weakness; this diversity would produce a dialogue between a variety of becomings that would resist bureaucratic structure as well as provide a space for happy accidents and breakthrough invention“ (ibíd). This kind of electronic social intervention could be thus carried through mechanisms such as temporary webpages, encrypted sites, hacker strategies or even alternative structures such as the deep web. Recently, a new kind of political activism is getting developed within this unindexed World Wide Web in order to avoid the control and persecution that nation-state governments and corporations inevitably carry on the internet. During the first decade of the 21st Century two alternatives have risen in order to challenge cyber-utopianism as the ideology behind the use of information technologies for social change: technorealism and techno-progressivism. However, some phenomena such as the Wikileaks case have been still interpreted within the scope of a potential cyber-utopian reality. Even if cyber-utopianism has been proved a reductionist ideology, the very formulation of its principles implies that in many cases the internet´s future is viewed within the scope of social justice instead of commercial interests. Given the rapid flow of changing perspectives within the networks, as well as the rapidity with which technology itself evolves, most probably the propositions leading to a constructive conversation about the possibilities of virtual communities on a leaderless revolution will be the ones that flatten the path for both social change and electronic social interventionism. Routinely distinctions between cyber-utopians/skeptics ideologies only disparage and enclose ideas into a predetermined standard, thus leading to static approaches and social stillness. BARBROOK, R. and CAMERON, A. (1996)  "The Californian Ideology". Science as Culture 6.1 (1996): 44-72. BRETON, P, (1995), L'utopia della comunicazione. Il mito del villaggio planetario, Utet: Torino. MACKINNON, R (2012), Consent on the Networked: the worldwide struggle for the internet freedom, New York: Basic Books. MATTELART, A. (2000), Historia de la utopía planetaria, Barcelona: Paidós. This page was last modified on 3 June 2015, at 12:55. This page has been accessed 122,824 times.